Theatrical Outfit’s slogan is that they provide “Stories That Stir the Soul” and they definitely live up to that with their production coming to The Balzer Theater this fall. With the 12th anniversary of September 11, 2001 fast approaching, it is only fitting that “The Guys” debuts on the day the play revolves around. 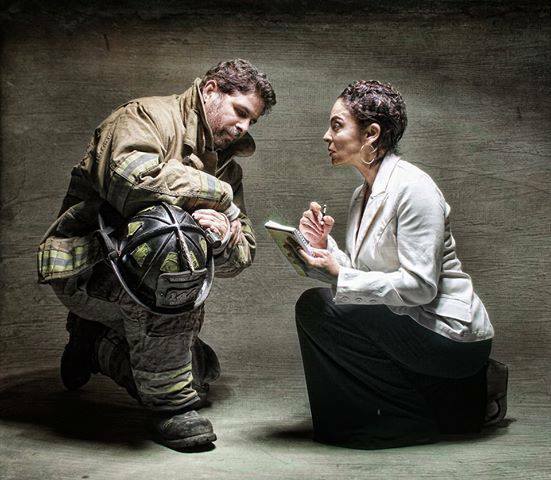 Based on playwright Ann Nelson’s own story, we meet Joan, an editor, as she receives an unexpected phone call from Nick, the fire captain. He requests her help on composing the many eulogies he must deliver at memorial services for the men he lost on 9/11. As the afternoon wanes, a friendship grows while the two navigate the emotional landscape of grief, drawing on humor and the bonds of a common humanity. In 2002, the story was made into a film with the same title starring Sigourney Weaver and Anthony Lapaglia and was directed by Jim Simpson. Guy is best known for her role in A Different World, for which she won SIX consecutive NCAAP Image Awards and numerous other honors. Her film credits include Spike Lee’s School Daze, Eddie Murphy’s Harlem Nights, and the indie films Klash, Diamond Men, Guinevere, and The Heart Specialist. Kurlander has guest starred on several television dramas and comedies and has worked in the theater industry in New York, Los Angeles, Alabama, Georgia, Utah, and Milwaukee.